Australia’s pace trio turned up the heat on England on the opening day of the third Ashes Test in Perth on Thursday. After Joe Root won the toss and elected to bat, the tourists were 175 for four at tea facing hostile bowling on a bouncy WACA Ground wicket hosting an Ashes Test for the last time. Dawid Malan was on 42 and Jonny Bairstow was on 14 at the tea interval, with the visitors stewing over the contentious dismissal of opener Mark Stoneman during the match’s second session. The visitors were well-placed just before lunch at 89 for one, but lost James Vince (25) minutes before the first break and were then subjected to a brutal barrage of fast, and often short, bowling after the resumption. Josh Hazlewood, Mitchell Starc and Pat Cummins terrorised the English with aggressive bowling that was often more than 90 miles per hour. 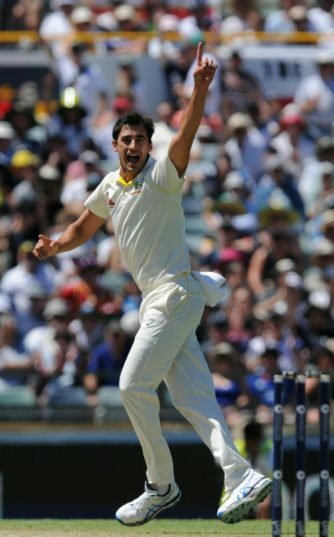 Starc claimed two wickets, and his fellow quicks took one each. The pace and bounce of the WACA is one of the main reasons English have only won once in Perth since 1970, and captain Joe Root was the first victim after lunch, caught down the leg side off the bowling of Cummins for 20. But it was Stoneman, who had looked in very good touch before lunch, who was on the receiving end of the most brutal Australian bowling as the home side sought to close in on reclaiming the Ashes after taking a 2-0 lead in the series in Adelaide. Stoneman somehow survived a torrid period that saw him dropped twice on 52 — the first a sitter at slip by the recalled Mitchell Marsh — and struck by a fierce blow on the helmet while on the same score. He survived all that, only to be contentiously given out caught behind off his glove to Starc by third umpire Aleem Dar for 56. Stoneman fended at a sharply rising delivery from Starc and wicketkeeper Tim Paine pulled off a brilliant one-handed take, but on-field umpire Marais Erasmus turned down the Australian appeal. Australia called for a review and Dar took little time overturning the original decision, although there did not appear to be any conclusive evidence to support the reversal. The decision clearly upset the England camp, with Root and fielding coach Paul Collingwood coming out of the dressing rooms to voice their concern as Stoneman trudged off. Earlier Stoneman and Vince were aggressive in adding 63 for the second wicket, after former skipper Alastair Cook again fell cheaply on his landmark 150th Test appearance. After Root decided not to send the home side in again, as he ill-fatedly did in Adelaide in the second Test, Cook was trapped leg before wicket by Starc for just seven. Cook did not review the decision, and the scorer of more than 11,000 Test runs has just 69 in the series at 13.80.